Opposition of the thumb is the most important component of normal hand function. It is a complex movement requiring trapezio-metacarpal joint abduction, flexion and pronation. Thumb opposition requires the action of several muscles, those responsible for positioning the thumb and those providing compressive forces for pinch. Positioning of the thumb is provided by function of the median median i.e. the abductor pollicis brevis, opponens pollicis and the superficial head of the flexor pollicis brevis provide the abduction and pronation. The flexion is achieved with the deep head of the flexor pollicis brevis and longus muscles. Power of the pinch is more a function of the ulnar nerve i.e. the lumbrical, interossei and the adductor pollicis along with the flexors of the index and middle fingers. The thumb is responsible for most of the pulp-to-pulp pinch and grasping movements involved in day- to-day activities like writing, buttoning a jacket, tying shoelaces, picking up a coin, and other basic activities of daily lining. Therefore, its loss constitutes a significant disability. The loss of this movement may occur as a result of median or ulnar-median nerve paralysis as seen in peripheral nerve injuries, peripheral neuropathies and poliomyelitis. Long standing untreated carpal tunnel syndrome can result in a low median nerve palsy and atrophy of the median nerve inervated muscles of the thenar eminence and therefore lack opposition. Multiple types of procedures have been designed to restore oposition including the Camitz procedure (Palmaris Longus to APB); Riordan Opponensplasty (FDS ring to APB); Extensor Indicis Proprius transfer (EIP to APB); Huber Opponensplasty (ADQ to APB). Incision is marked out over the index MPJ to begin harvest of the extensor indicis proprius. The EIP is traced back to the musculo-tendinous junction so that it can be rerouted around the ulnar side of the wrist. 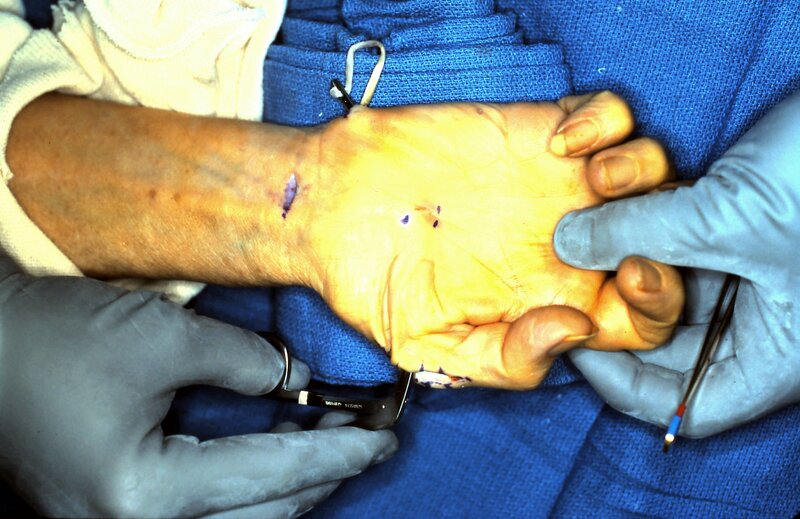 The tendon is re-routed around the ulnar side of the wrist in a subcutaneous plane. Through a small incision on the ulnar side of the hand the EIP tendon is brought around the pisiform and across the palm also in a subcutaneous plane the level of the thumb metacarpo-phalangeal joint. The tendon is then woven into the normal insertion of the abductor pollicis brevis. Intra-operatively showing the palmar abducted opposed thumb position which will restore pinch after a period of rehabilitation. Post-operative full extension of fingers and thumb as well as full radial abduction of thumb. Lateral view showing degree of palmar abduction and opposition. Opposition to the little finger is achievable.